Here are the best Bluetooth turntables that allow you to stream your vinyl recordings wireless via Bluetooth connectivity – you simply need to pair your turntable with your Bluetooth speaker and enjoy clean and uninterrupted sound performance. These vinyl turntables can play your favorite vinyl soundtracks and also support RCA or 3.5mm auxiliary connections to your speakers for private listening. These turntables feature easy operation and are easy to use and operate for playing vinyl recordings; they have an automatic belt-drive design that increases fidelity and sound performance. Furthermore, some of these vinyl turntables come with built-in speakers so you can listen to music directly from the vinyl player – you can play vinyl recordings, stream music via Bluetooth or use the 3.5mm auxiliary port to connect to the speakers. These Bluetooth turntables also feature a headphone jack for private listening. If you are looking for some of the best Bluetooth turntables with wireless connectivity, be sure to check out our top picks below! We pick the best Bluetooth turntables through a combination of various factors, including sound performance, ease of use and Bluetooth streaming capabilities. These Bluetooth turntables support belt-drive technology and usually feature 3 speed RPM which allow you to listen to your vinyl recordings depending on your preferences. Some of these turntables allow you to stream music directly from the turntable to your wireless Bluetooth speaker. They also come with auxiliary outputs and RCA outputs for you to connect to home stereo speakers to enjoy the music. Some of these turntables feature a portable suitcase design with built-in speakers which might come in handy if you are looking for a more portable turntable option. Here are the best Bluetooth turntables that we have tested that provide crystal clear sound performance with detailed frequency response and functionality. They are compatible with almost all Bluetooth enabled devices and provide 3-speed RPM sounds. These turntables also feature a unique vintage and desk-like design which looks aesthetically pleasing and a great way to enjoy vinyl records. 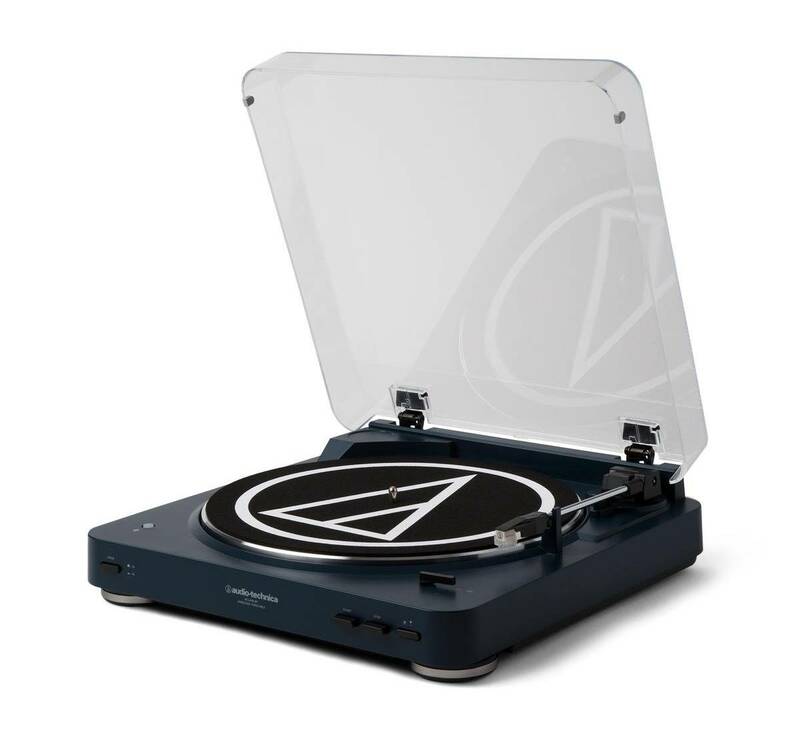 The Audio Technica AT-LP60BK is a Bluetooth turntable that allows you to connect wirelessly to Bluetooth-enabled audio devices or to wired audio systems and speakers with included dual RCA output cables. This turntable allows you to rediscover your classic 33-1/3 and 45 RPM records on this fully automatic belt-drive turntable. The AT-LP60’s belt-drive design isolates the platter from motor vibrations, resulting in creased clarity and high-fidelity audio. It also supports up to 8 different Bluetooth device profiles which can be stored in the system memory for quick connections. 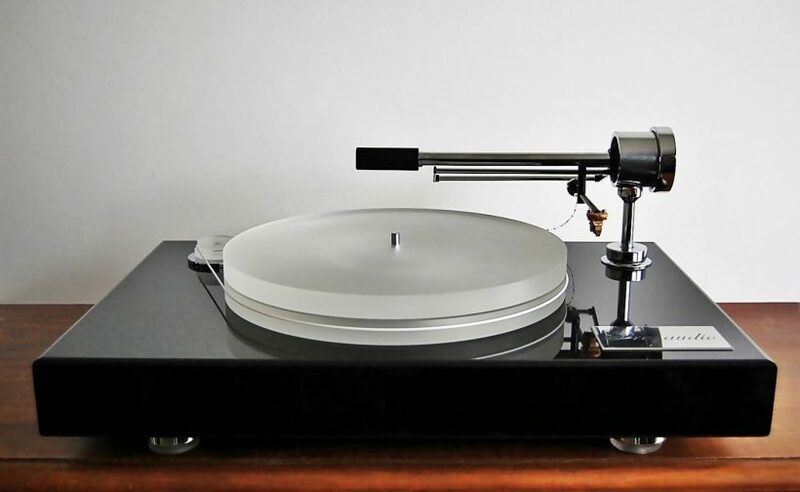 The turntable surface is made of anti-resonance, die-cast aluminium to minimize vibrations. We also liked the fact that the LP60BK features integrated Audio-Technica dual magnet phono cartridge with replaceable diamond stylus for ease of use. The LP60BK features built-in switchable phono pre-amplifier with RCA output cables to connect to audio systems and powered speakers. The entire Bluetooth turntable comes with two output adapter cables, dual RCA to mini-plug male and dual RCA female to mini-plug female, and 45 RPM adapter. If you are looking for a Bluetooth turntable that can connect wirelessly to Bluetooth audio devices, the AT-LP60BK comes highly recommended. 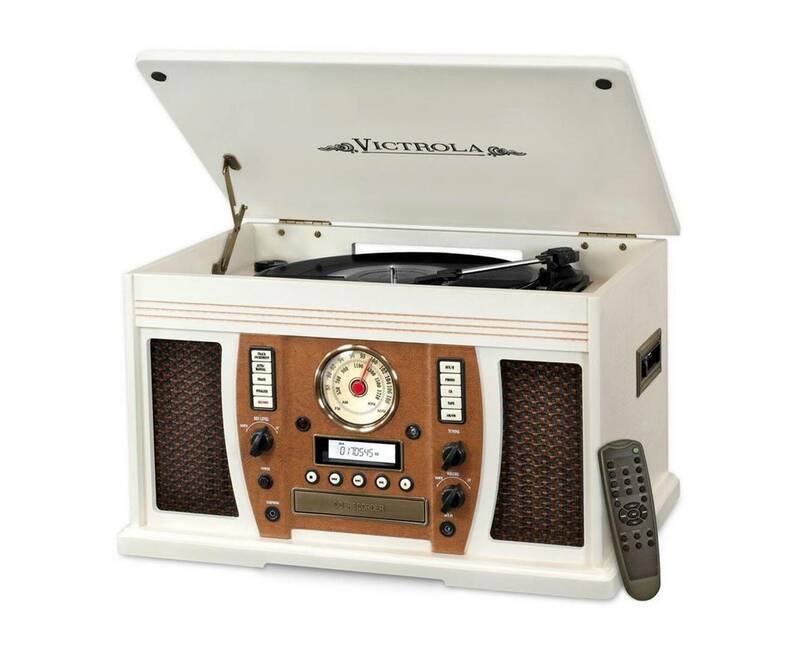 The Victrola Vintage Bluetooth turntable is a three-speed turntable (33, 45, 78 RPM) that plays all of your vinyl records and favorite albums. This turntable has a classic vintage design and is loaded with features – it comes with built-in Bluetooth technology to wirelessly stream music from any Bluetooth enabled device without any cords required. It also comes with built-in stereo speakers for your to enjoy your music while listening to your favorite vinyl recordings. This Bluetooth turntable has a portable suitcase design with easy carry handle – it has a 3.5mm auxiliary input jack for playing music from any non-Bluetooth device and a headphone jack for private listening. The turntable allows you to stream music wirelessly from up to 33 feet away and supports smartphones and tablet devices. We liked the fact that this turntable also comes with easy control buttons including power on, off, volume controls and a manual stop selection switch. Music performances on this turntable sound very crisp, detailed and clear with nice harmonics and vocals. The built-in speakers are decent and do not require any batteries. 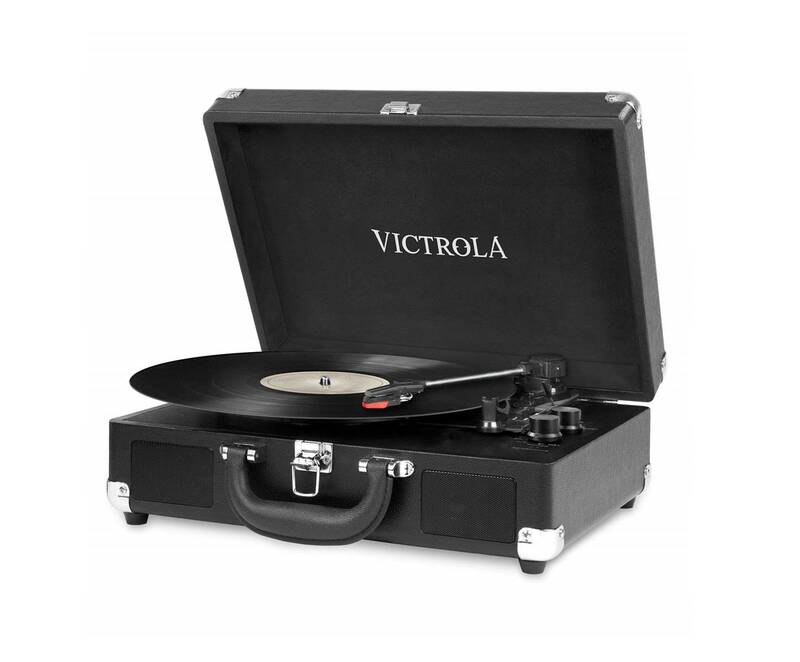 If you are looking for a suitcase-style Bluetooth turntable to listen to music on the go, the Victrola turntable is definitely a great choice. The Ion Audio LP 3-Speed Bluetooth turntable is a high-performance turntable that can bring your music soundtracks and vinyl recordings to live. You can unleased your record collection with this vinyl turntable player and stream your vinyl wirelessly via Bluetooth – you simply need to pair the turntable with your speaker and enjoy fuss-free connectivity with a 10m range. It also features traditional connectivity options including discrete RCA ports for playback through an existing wired speaker system and a 1/8 inch headphone output for private listening. The sound quality on the Ion LP turntable is crystal clear with crisp highs, detailed midranges and smooth lows. The turntable also includes a 1/8 inch auxiliary input and cable to convert sound from other media sources including cassette players and CD players. This Bluetooth turntable plays and converts 33, 45 and 78 RPM recordings and has an elegant piano black finish which makes the Ion Audio LP suitable for modern home interior décor. We also liked the fact that this Bluetooth turntable supports ultra-quiet operation with auto-shop – a quiet belt drive system combines with auto-stop for effortless, convenient operation that stops spinning when it reaches the end of the record. It also has a conveniently located 3.5mm headphone output for private music listening. You can use the Ion LP to pair to your Bluetooth-enabled speakers and transmit the sound from vinyl directly to the speakers without any issues. Overall, the Ion Audio Bluetooth turntable delivers exceptional sound quality and we highly recommend them. The Victrola Aviator Wood Bluetooth turntable is a stunning vintage designed turntable that delivers really nice sound performance and comes with a variety of built-in features. 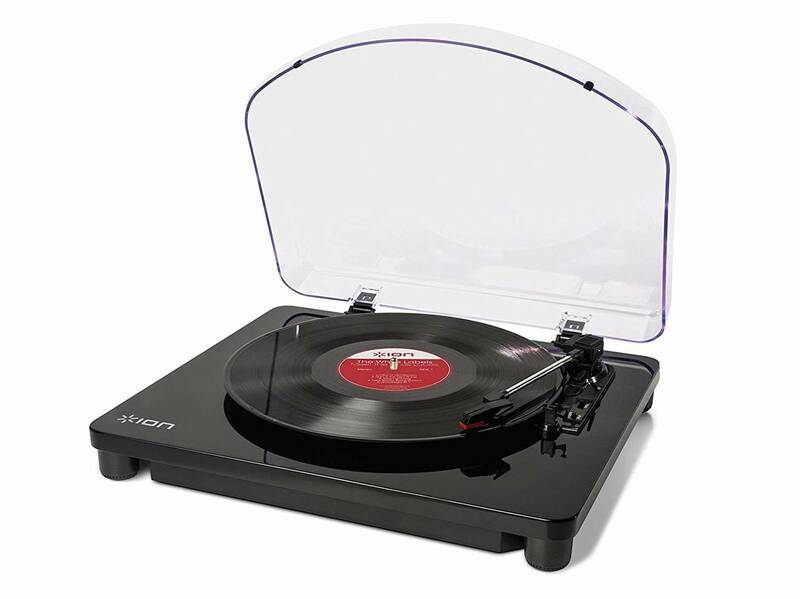 It is essentially a three-speed turntable (33, 45 and 78 RPM) that plays all your vinyl recordings and favorite albums. The turntable has luxurious real wood construction and comes with built-in Bluetooth to wirelessly play music from your Bluetooth enabled devices with no cords required. This Bluetooth turntable allows you to record directly from vinyl, CD and cassette directly to USB without any computers. It comes with a built-in CD player, cassette player and AM/FM radio with old fashioned rotary tuner – it also includes a full function remote control and stereo speakers. 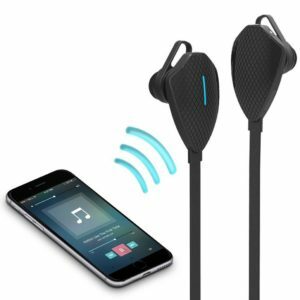 The Bluetooth capability streams music wirelessly up to 33 feet and also has a 3.5mm auxiliary input for music from any non-Bluetooth device, with RCA aux-in and headphone jack for private listening. Music performances on the Victrola turntable sounded very crisp and audible with clean details, and we thoroughly enjoyed listening to instrumental and classic genres on the Victrola with its vintage setting. 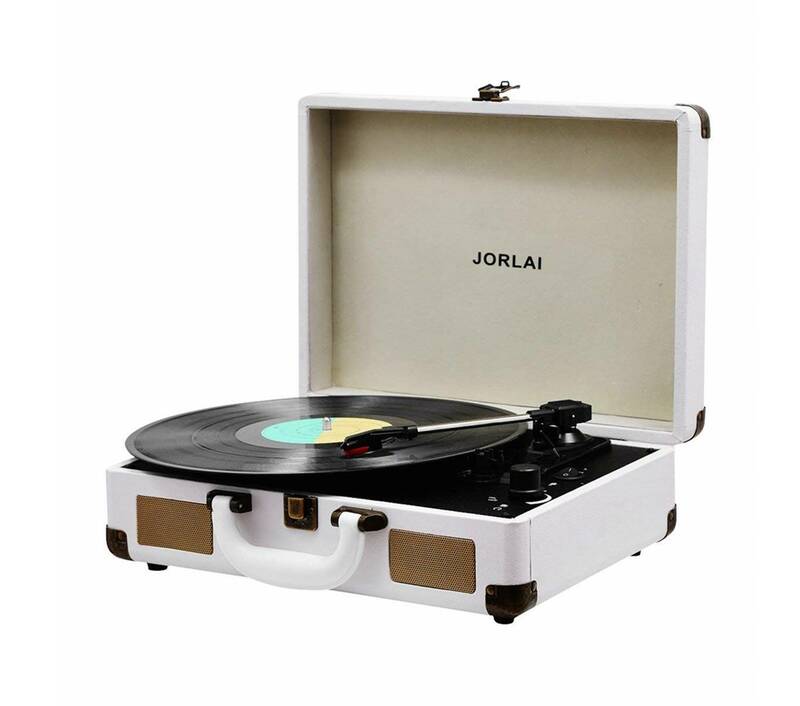 The JORLAI Bluetooth turntable is essentially a 3 speed record player (33, 45 and 78 RPM) with belt-drive technology to play all your 7”/ 10” / 12” vinyl records with crystal clear sound reproduction. It is a Bluetooth-enabled turntable with RCA out and auxiliary inputs – you can also stream your iTunes through the record player over the Bluetooth connection. The RCA 2 channel connection on the back of the record player allows you to hook it up to your external stereo system for amplification. This Bluetooth turntable supports vinyl to mp3 recording which renders a much fuller spectrum of sounds and frequency ranges as compared to compress music audio. The sound performance from the JORLAI turntable is full, lifelike and realistic. It also comes with software which you can use to record WAV/MP3 audio from a vinyl record for later playback on your computer and mobile devices. We liked the fact that this Bluetooth turntable comes with an elegant carrying case – the wood record player with PU leather looks exquisite in any living room and the briefcase design makes it easy for moving it from room to room. The entire Bluetooth turntable has a unique design and comes with a built-in 2100 mAh rechargeable lithium battery and built-in Bluetooth speakers with RCA output and headphone jack for private listening. There is also a gentle one touch lever that can raise the tone arm above the record and slowly lower the need onto the record for convenience. 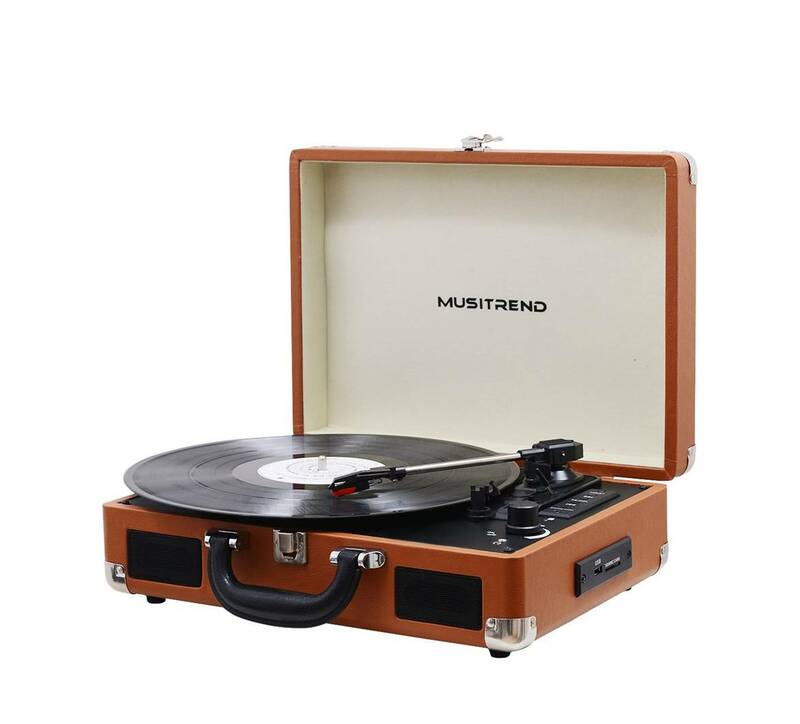 The Musitrend Bluetooth turntable is a vintage-looking turntable with built-in speakers, USB/SD recorder, rechargeable battery and headphone jack. It features a portable suitcase design with wooden cabinet and PU leather wrapping and easy carry handle. The Musitrend turntable has a 3 speed record player which is adjustable to play 33, 45 or 78 RPM records and even comes with a 45 RPM adapter. The Musitrend turntable supports vinyl to mp3 recording and is capable of recording high quality mp3 audio from a vinyl record to an SD card or via USB for later playback on your computer and mobile devices. The Bluetooth turntable has a multi-function design with wireless Bluetooth, rechargeable 2100 mAh battery, built-in stereo speakers, RCA output and headphone jack for private listening. It also comes with an auxiliary input for smartphone and home stereo use. When we tested this vinyl turntable, we were impressed by the sound quality and the detailed crisp frequencies – the audio sounded very detailed and well-defined. The turntable also has a good construction with brown exterior and white interior which blend in nicely with modern home interior décor. This Bluetooth turntable comes with a box package, one replacement stylus needle and user manual for easy reference. The Archeer Bluetooth turntable is a highly versatile 3-speed turntable for stereo recordings and plays at 3 vinyl speeds at 33, 45 and 78 RPM. It also supports 7/10/12 inches records with a diamond stylus to track your record grooves with greater precision and accuracy for high definition audio. This Bluetooth turntable has high compatibility with wireless devices and supports Bluetooth and 3.5mm auxiliary-input as well as USB stick audio inputs – making it great for smartphones, laptops, tablets and computers. It has a built-in full range stereo speaker and RCA output; you can play music from all your favorite compatible devices via the turntable’s speakers, or connect the turntable to an external speaker through RCA to improve sound. The Archeer turntable features vinyl-to-mp3 recording which can transform audio from vinyl records into mp3 format files and save it on your USB flash drive for later playback. 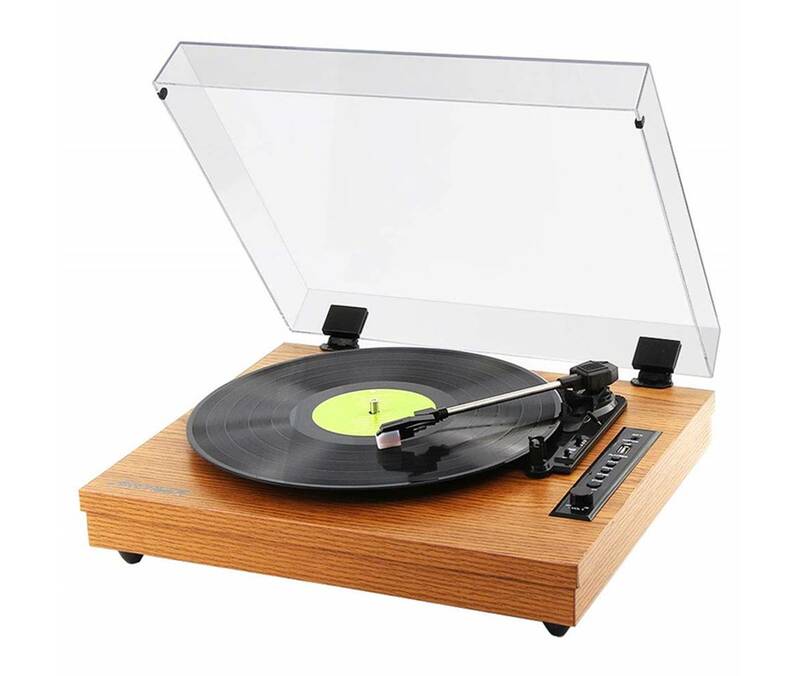 We liked the fact that the Archeer turntable features a retro nostalgic style with a solid wood appearance and removable dust cover; it has a discrete appearance that blends in nicely into modern home interior décor. Music performances on the Archeer turntable sounded very crisp and well-defined; you can pick up details in the music which you might not have heard before and delivers high-accuracy sound quality. 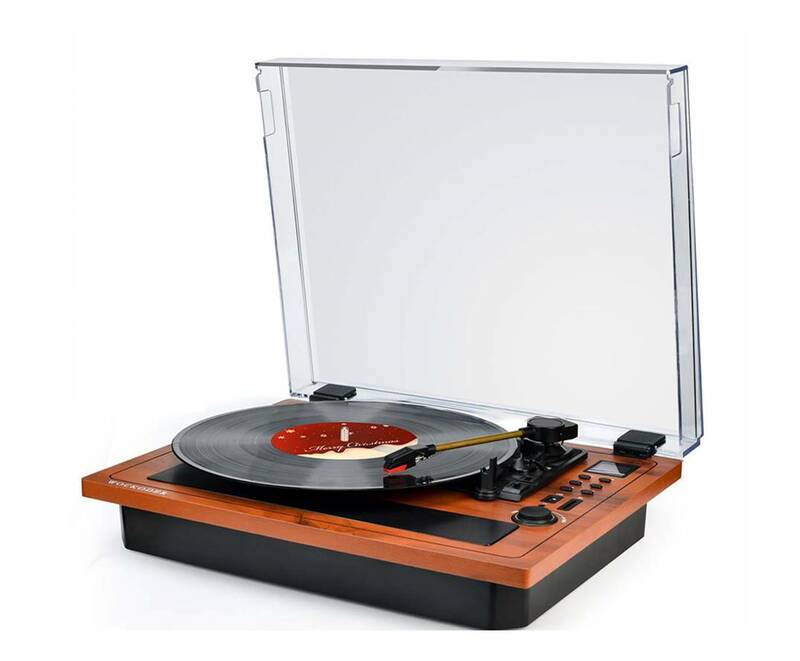 The entire package comes with the wooden Bluetooth turntable, power adapter and user manual for easy reference. The B&L Bluetooth turntable is a 3-speed stereo turntable with 33, 45 and 78 RPM speed that fits all vinyl records and has a portable 45 RPM adapter. This Bluetooth turntable comes with a visible window that provides a good viewing experience for your vinyl recordings and also protects it against dust. The B&L turntable features a recording function – you can record from vinyl records directly to mp3/WMA formats via USB device with no other software required. The B&L Bluetooth turntable has multi-function capabilities including wireless Bluetooth and a 2200mAh rechargeable battery with built-in stereo speakers and RCA outputs. It also comes with a headphone jack for private listening and auxiliary input for smartphone and home stereo speakers. This turntable comes with built-in 2 X 2.5W output – the high quality stereo speaker is built into the antique turntable record player and allows you to play vinyl with distinct clarity and precision. The B&L turntable operates a belt-driven system with direct USB/SD encoding for turntable and comes with a 45 RPM adapter. When we tested the B&L Bluetooth turntable, we enjoyed the crisp vocals and instrumental music reproduction with very well-defined details and no distortion at high volume levels. They can bring out the details in the music which you might not have heard with compressed audio files. The entire package comes with the Bluetooth turntable, power adapter, user manual and 45 RPM adapter. 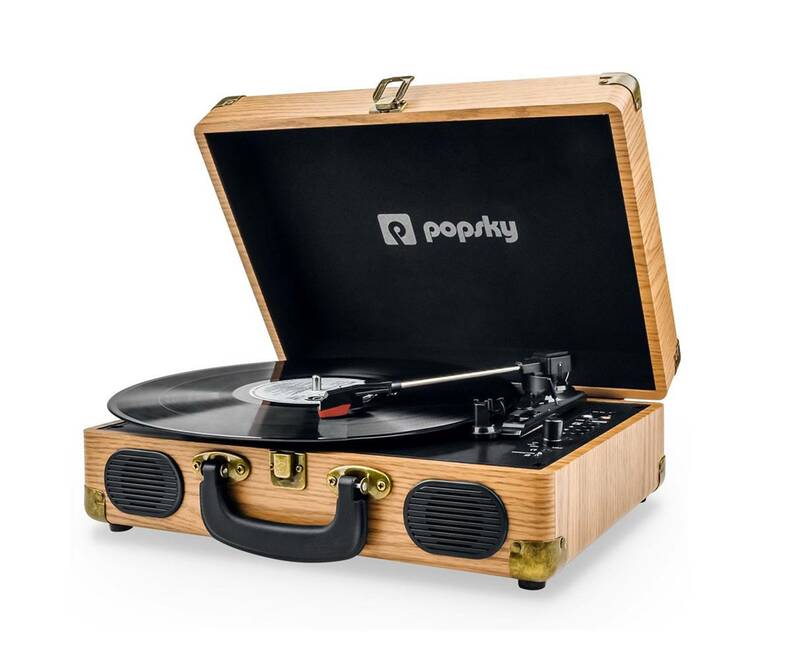 The Popsky turntable is an innovative and unique turntable with a vintage suitcase design. The entire system is housed in an old-fashioned suitcase with wooden patterns and comes with a 3-speed belt driven turntable for 7”, 10” and 12” vinyl records with 45 RPM adapter included. It is an all-in-one vinyl player so no additional setup is required. The Popsky turntable comes with 2 built-in full-range stereo speakers to ensure crystal clear sound performance and has an anti-resonance design with 3 elastic plugs under the platter to minimize vibration. This Bluetooth turntable has built-in Bluetooth that can play music directly from your smartphone, laptop and tablet devices. It also comes with a 3.5mm auxiliary and RCA/USB headphone jack for private listening. We liked the fact that the vinyl player has an auto-stop function that switches the vinyl player off once the track is completed. The Popsky Bluetooth turntable supports vinyl-to-mp3 recording with no software needed and can transform audio from vinyl records into WAV or mp3 files on the go. To top it off, this Bluetooth turntable has a built-in 2500 mAh rechargeable battery that provides up to 8 hours of continuous music playtime on a single charge. If you are looking for a Bluetooth turntable that has 3-speed functionality (33, 45 and 75 RPM) with wireless connectivity and built-in stereo speakers, the Popsky Bluetooth turntable is a great choice. The Wockoder Desk Bluetooth turntable is a retro-style wood desk turntable with a natural wood design and protective dust cover and easy-to-control multiple connections panel. You can switch between Bluetooth and USB SD cards, and connect your iPhone and Bluetooth speakers with the Wockoder turntable to provide a better listening experience. 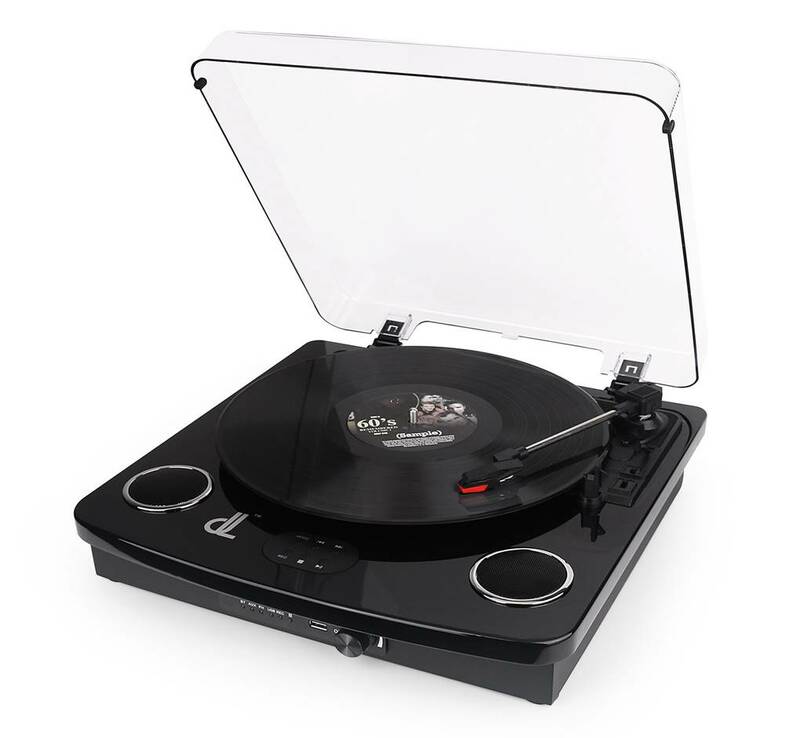 It has multi-player functionality and allows you to convert your vinyl records to digital audio files – you can transform LP music/Bluetooth/AUX-in music to mp3 format files and save it on your mp3 player, USB or SD card. The Wockoder is a 3-speed turntable (33, 45, 78 RPM) with 7”, 10”, 12” size record and is compatible with all Bluetooth devices and smartphones. We liked the fact the Wockoder delivers high quality sound performance with built-in 2 X 5W stereo speakers. It also has RCA audio outputs which provide another option to connect the turntable to your home stereo system and powered speakers for an enjoyable listening experience. The Wockoder has a very sleek and modern design with an anti-resonance, die-cast aluminium platter. It also has a high quality rudy stylus for playing vinyl and plastic cover over the turntable for extra protection. If you are looking for a retro-style Bluetooth turntable for classic audio experience, the Wockoder turntable is a great choice. Overall, vinyl Bluetooth turntables are a great way to enjoy your vinyl recordings and music by providing higher quality music performance as compared to compressed audio files. Vinyl can store more music data and provide a much richer and cleaner sound performance – with wireless Bluetooth streaming directly to your music speakers. It’s the perfect solution for audiophiles looking to listen to their vinyl recordings but also want the convenience of wireless Bluetooth connectivity. Some of these vinyl players also have built-in stereo speakers and battery for portability, although we would ultimately recommend high-end stereo speakers for better sound quality.